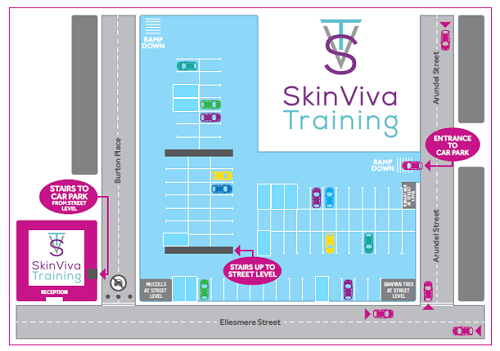 At SkinViva Training, we’re happy to offer free parking to all delegates via our underground car parking facilities. We just need you to confirm prior to your course to ensure we reserve you a car parking space for the day. How do I confirm a car parking space? All our delegates receive a pre-course text asking to confirm whether you wish to reserve a car parking space in our underground parking facilities. If you do wish to park, just reply with YES and our car park attendants will save you a space. A few hundred metres from the clinic is the entrance to our underground parking facilities, where Dave and June (our car parking attendants) are on hand to assist. Spaces are available on two levels. Please wait to be escorted by the car park attendant, for Health and Safety purposes. Customers are not to park on the ramp, but wait for assistance on the road where the sign is located. SkinViva parking is signposted, as seen below. The map below may also be helpful. Please note, you are not to enter the car park unattended. If you do enter the car park and park without a permit you will receive a parking fine which you are liable for. Disclaimer: all park at their own risk. Remember to leave plenty of time for your journey as late arrival time cannot always be honoured.